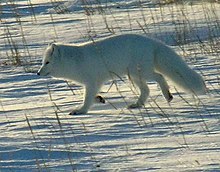 The Arctic tod (Vulpes lagopus), an aa spelled Airctic tod, an aa kent as the white tod, polar tod, or snaw tod, is a smaa tod native tae the Arctic regions o the Northren Hemisphere an common throuoot the Arctic tundra biome. It is well adaptit tae livin in cauld environs. It haes a deep thick fur which is broun in simmer an white in winter. Its bouk lenth ranges frae 46 tae 68 cm (18 tae 27 in), wi a generally roondit bouk shape tae minimize the escape o bouk heat.